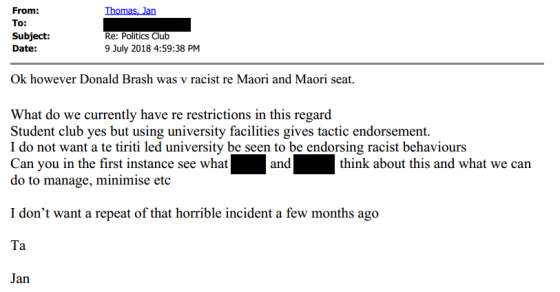 Two responses from Massey University today in response to Massey Vice Chancellor appears to have lied over Brash ban – Jan Thomas has backed her controversial position, but there two motions of censure have been put to the Massey Academic Board. Not surprisingly that was widely criticised as it didn’t really address her misleading or false claims. Some on Massey University’s board are moving against its Vice-Chancellor, after she stopped Don Brash from speaking at the Palmerston North campus. Two motions have been tabled to censure Vice-Chancellor Jan Thomas, after emails were revealed showing she grappled with Brash’s speaking engagement before cancelling the event over security concerns. Deputy Vice-Chancellor Chris Gallivan told Larry Williams the first motion simply relates to the cancellation. Gallivan says the board will vote on the motions when they meet in a month. He says if the motions pass, it will effectively be a telling off, and won’t directly affect Thomas’s job. Good to see the motions of censure, but not addressing it for a month seems ridiculous, this will drag it out, with a stink remaining over free speech at Massey. And it sounds like any vote in favour of censure will be little more than mildly symbolic. What is ‘free speech’ in a New Zealand context? There has been a lot spoken and written about free speech in New Zealand lately, sparked by the visit of Canadians Stefan Molyneux and Lauren Southern. Most people seemed to see them as extreme-ish agenda driven attention and money seekers, with many people supporting their right to speak here but not agreeing with what they said or did much. 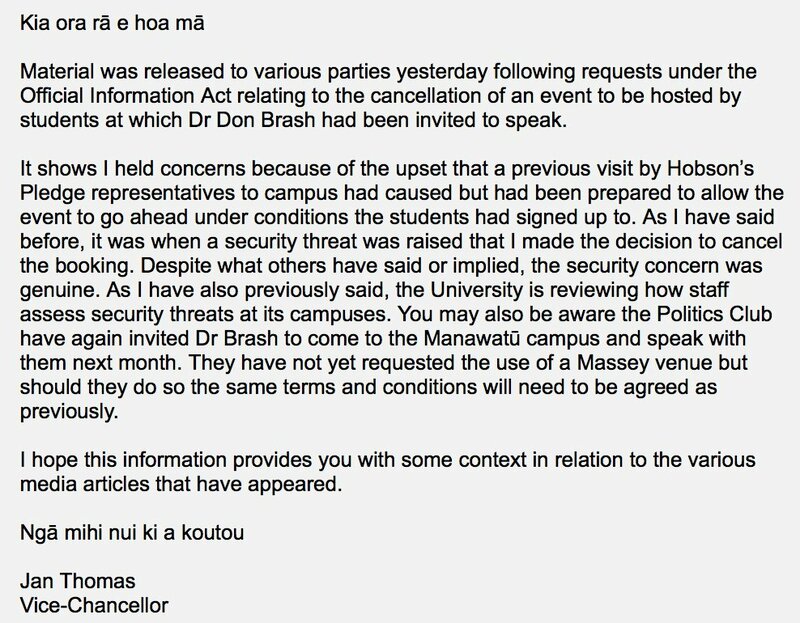 The cancellation of a political event at Massey University this week that as going to feature Don Brash was widely (not quite universally) condemned. Brash got far more publicity over that and a at a debate at Auckland University on Thursday than he would otherwise have got. But what is free speech in New Zealand? Lizzie Marvelly has a go at explaining (it’s a column worth reading, one of her better ones in a very mixed portfolio) in Why can’t I escape Don Brash? What has become overwhelmingly clear in the midst of the tide of hysteria and hyperbole is that there are many people who don’t really grasp the true meaning of free speech. Having the freedom of speech just means (with a few exceptions, such as in matters of national security and hate speech) that the state doesn’t have the right to prevent citizens from expressing themselves or punishing them if they do. It can’t throw people in jail for speaking out against the Government, or to prevent them from speaking out. Free speech doesn’t mean everyone has the right to speak in whatever venue they please. It doesn’t mean that people who disagree with a speaker can’t argue or protest. It doesn’t mean that people can say vile, violent and inflammatory things without fear of prosecution. 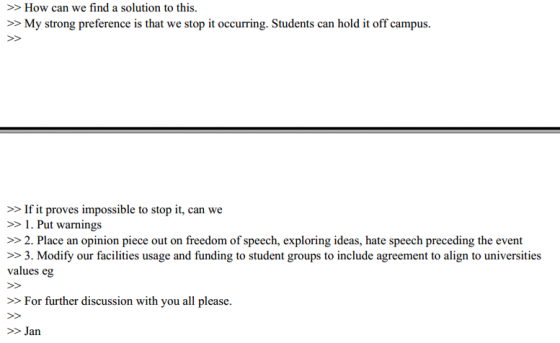 As the person who wrote to Massey’s Vice Chancellor alluded to, just because we have the right to free speech, it doesn’t mean we won’t face consequences for what we say. This doesn’t address the issue of a politician like Phil Goff trying to dictate whose views could be expressed at an Auckland Council owned venue. 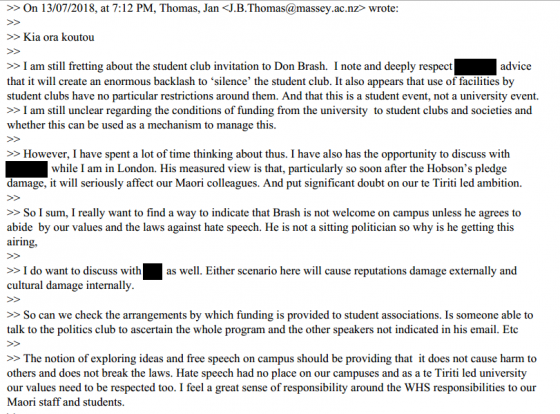 Nor does it address the considerable concerns over Jan Thomas deciding which ex-politicians should be effectively banned from speaking at a Massey University student political society event. But those issue shave been well covered already. Since New Zealand just had to discuss the meaning of free speech, perhaps it is worth defining what free speech is. And what it is not. As strong as this sounds, this provision only confers an individual right to hold and express opinions. It compels no one else to share, promote or publish them. And this, more than anything else, is the fundamental misunderstanding in our recent debates. Again this doesn’t address Goff’s apparent involvement in deciding who could use a venue based on what he thought they might say. Even Massey University’s banning of Don Brash’s speech is, strictly speaking, not a case of restricting free speech. Within hours of being uninvited, Dr Brash’s manuscript was published on the Herald’s website, and he could explain himself on radio and TV. That is hardly a case of effective censorship. And universities, too, can lawfully determine how their resources are used. The real scandal of banning Dr Brash lies elsewhere. By uninviting Dr Brash, Massey University has not been true to its own values. Massey’s Charter commits it to promoting “free and rational inquiry”. That is what the very idea of the university is all about. If universities cannot tolerate dissent and the free exchange of heterodox views, they cease to be universities. It would make them indoctrination camps. In short: Freedom of speech is important. Not every restriction of expression is objectionable. And universities must remain true to ideals of academic inquiry. Everyone is free to speak to themselves by their own means. Beyond that there is no guarantee others will listen or will provide a means to speak. But there is a need for politicians and universities to be impartial and unobstructive when making decisions on who can speak in their domains, and to do that they need to risk erring towards allowing speech. They cannot know what will be said in advance of an event. here at Your NZ free speech is very important, but not absolute. I need to make decisions to protect this site from legal actions, and I also choose to protect speakers here and targets of opinions from unnecessary abuse and attacks. It’s imperfect but well-intentioned for the good of both speech in general but also of the community here.